Well this is interesting. As manufacturers make bigger and bigger handsets, Dubai-based Neo is making one of the tweeist handsets known the man. 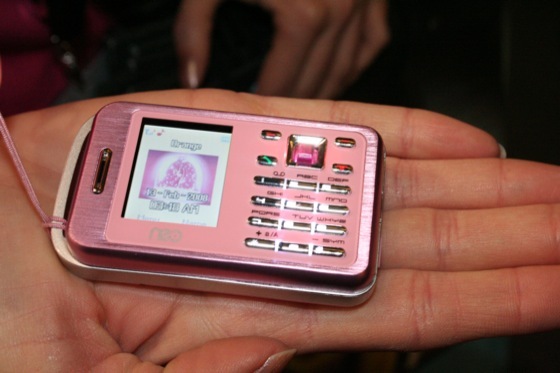 The 808i has a 4-megapixel camera, WiFi, and plays MP3s and MPEG4s. It’s also small enough to be ingested by a Shi Tzu. They should be available in the US shortly, with no carrier mentioned. I suspect this will be an online sales play although the ladies of Neo didn’t offer much info. Time will tell. Neo is now looking to launch globally targeting, Europe, USA and Asian markets. On receiving its FCC, CE and GCF certifications, Neo phones are now fully certified and tested. Neo will also be launching 3 more handsets by the end of the year.